Just noticed this review of Canon’s new point-and-shoot with an incredible 50X zoom lens, and that got me to thinking about the continuing search for the perfect inexpensive multimedia camera. In a previous job (at AOL’s Patch) I spent a fair amount of time trying to figure out the best cheap camera to get for our reporter/editors. We were looking for something in the $300 range that was not too bulky that folks who had little experience with a camera could use to shoot good stills and video. There are a lot of camera reviews on the Web of models such as Canon’s 5D (or the equivalent Nikon model) in the $3,000 range, and then you generally drop down to something like Canon’s mid-range EOS models (I have the T4i, the current model) that cost about $900 with a couple of lenses. (And yes, Nikon and lots of other folks have comparable models). But when you drop down to the $250-$450 range, most of the reviews don’t find much to differentiate the different models except the arrangements of the controls. That’s unfortunate, because for shooting news and sports, there are at least three features that are really important and often overlooked: optical zoom, how many frames the camera shoots per second in burst mode, and whether it has a jack to plug in an external microphone. I’ll leave the technical reviews of the Canon 50X to the experts. There’s a nice one here, on The Wirecutter, that has good comparisons to competitors; and one by TechRadar is here. They both like the camera overall, but it’s that incredible 50X zoom that wows them. So how good is a 50X zoom? You probably have about a 5X or 10X optical zoom if you have a point-and-shoot camera. If you have a DSLR, your lenses most likely range from something around 24mm to maybe 300mm. The Canon 50X goes from 24mm all the way to 1200mm and that is simply the best zoom anywhere on a relatively inexpensive point-and-shoot. How inexpensive? I found it as low as $379 in a quick Web search. But why does the zoom matter? After all, one of the first rules I tell students in my multimedia class is to get as close to their subject as possible, to “zoom with your feet.” That’s always great advice, but in reality, particularly when you’re shooting news and sports, it doesn’t always get you the photo you want. I first had my eyes opened to the power of a good zoom a few years ago, when we bought a Casio EXILIM for our sports editor with a 20X zoom (sorry, can’t remember the model number; it’s been five years). Before giving it to him, I took it out myself to shoot a tennis match and a lacrosse match, just to see what it would do, and the results were pretty amazing. I’d previously used my Nikon Coolpix point-and-shoot with a 5X zoom to cover a baseball game, so I had a pretty good idea of the limitations of a traditional point-and-shoot camera. The best location to shoot baseball is generally behind first base, but there were bleachers and a fence there so I ended up behind third base. That gave me a decent shot of right-handed pitchers, and any base-runners heading around second base toward third and home, but whatever happened at first base or in the outfield was just too far away. The tennis match presented similar challenges in terms of distance — Three singles matches were going on at once, and the court was surrounded by a chain link fence, so I was stuck standing at the fence, poking the lens through the openings. But the Casio camera’s 20X zoom let me get close enough to get good facial expressions, even from 100 feet away. A few days later, at a lacrosse match, the Casio’s zoom was critical to capture any action at all. Lacrosse is played on a very wide field, and it was simply impossible to get any closeups without the zoom. I can’t imagine what something with a 50X zoom — over twice as powerful — would let you capture, though I’m hoping to get a chance to find out. But I also learned that while a camera’s zoom range is important, you should also focus on the burst mode. Tennis is fast and if you try to capture the action by taking one shot at a time, you’re often too slow on the shutter. But the Casio had an incredible burst mode of 60 frames per second, with each frame a full 6 megapixels. Hit the shutter and then scroll through 60 images to find just the right one when the ball is ricocheting off of the racket, or when a lacrosse player snapped her wrist to slap the ball toward the net. Once I used that feature, I’d never consider getting another camera without it. But a fast burst mode is not just good for sports. I was discussing the camera with our sports editor sitting in a cafe and noticed a young boy eating ice cream sitting at a table outside. Although we were 50 feet away, the zoom let me get close, and the burst mode captured a great series of closeups of boy and ice cream (tongue out, eyes closed, etc.). The zoom let me get so close that I almost felt like a stalker, with its ability to invade someone’s private space without their ever knowing you were that close. Both the Casio and the Canon also shoot slow-motion video, another great asset when shooting sports. 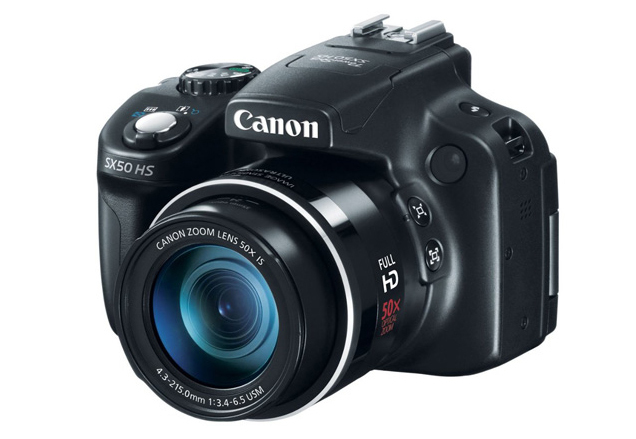 The new Canon shoots 120 frames per second (30 fps is standard) at 640 by 480 resolution. Casio now touts its EX-FH25, with a 20X zoom, that shoots 40 frames per second, each one at 9 megapixels. The Casio also has another feature that makes it particularly appropriate for sports and news — if you hold the shutter down halfway, the camera starts storing frames into a buffer and then when you press the shutter down fully, you can set it to save the frames already in the buffer. So you can capture something that occurred BEFORE you pressed the shutter, excellent for sports where by the time you realize a player is getting ready to do something significant and press the shutter, the action is already over. There are several competitors in the $300-$400 price range (e.g., Pansonic ‘s Lumix DMC FZ200), so I’m certainly not recommending either the Canon or Casio. What I AM recommending is that if you are considering purchasing an inexpensive camera for your newsroom or j-school, that you take a hard look at both zoom range and burst mode when making your decision. If you do a little digging, you’ll discover that there are now several affordable point-and-shoot models available that can capture shots that previously would have been unattainable without much more expensive gear. And yeah, they’re also lots of fun. Unfortunately, while these two cameras have great zooms and burst modes, they both have a flaw that makes them less-than-perfect for Web news and sports — neither appears to have a jack for an external microphone. I say apparently because I can’t find a review that says anything about an external jack, so I’m assuming it’s not there. That also says something about how most camera reviewers are traditional DSLR types who don’t understand the needs of multimedia producers, so it’s a feature they don’t mention. I gather the camera manufacturers believe that few camera users are really shooting video that requires decent audio, so they skip the inexpensive jack. But if you’re shooting news or sports, you need to interview folks, often on a noisy city street or sports arena, and the in-camera mic just doesn’t cut it. Yes, you can record the audio with a separate audio recorder (or even your smartphone — most of them include an app that does a decent job of capturing audio). Unfortunately, this is a flaw in every inexpensive point-and-shoot I’m aware of. Anybody know of one with an external audio jack, let me know.